We bought a family one-year National Trust membership and it was one of the best investments we've made for our family. This is because we use it. Every weekendwe have time for a family day out, we consult the National Trust map and off we go. Nice day? Somewhere with lots of outdoor space to explore and picnic in. Less nice? A house that will take time to look round, with activities for younger children. Meeting with friends? Yep, we National Trust it. We can't afford to be members every year so we go crazy with the National Trust properties while we can, then take a few years off until the boys are older and it's all fresh again. A week or so ago we visited Speke Hall in Liverpool. 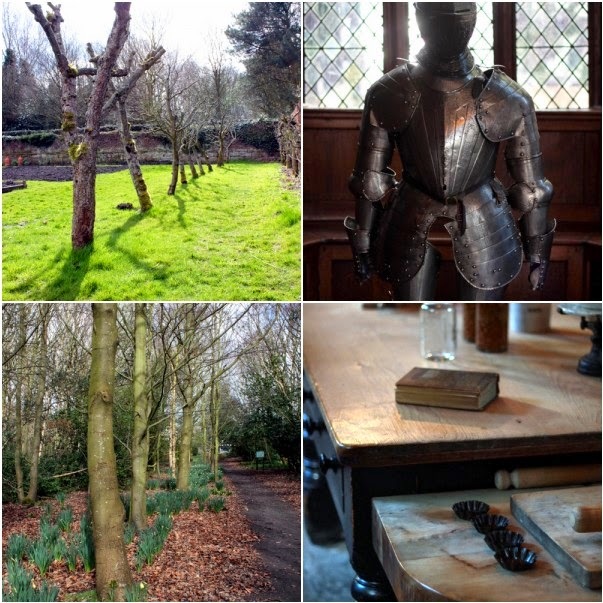 It's a beautiful Tudor property set in landscaped grounds, surrounded by a wood. And it has something extra that I don't think any other National Trust places have... it's right next to an airport. So you get the added extra of - wow! - aeroplanes taking off above you. It really helps to have a bit of variety to entertain little ones! So, I guess you want to hear some of the other plusses? We really did have a fabulous day out with our friends. The architecture is beautiful. For us 'grown-ups', from every angle there's something new to look at and different buildings to appreciate. For your children, there are little carved faces where you don't expect it, a moat (now grassed) to run round or roll down, and the house itself is just the right scale for littler ones. There are lots of nooks and crannies to explore, and woodland walks to take. Because the scale is smaller than a lot of the grand National Trust properties you may have visited, it is much more suited to little legs and it is much better for more independent exploring. As parents, you want your children to learn the thrill and the responsibility of being independent from you, but that desire clashes against a primal need to watch over them and protect them. Speke Hall just felt like the perfect place to find a harmony between those two needs. The house itself is beautiful. Unlike more museum-like places, it was set up with signs of life (like this Singer sewing machine - you can't expect me to ignore a sewing machine!) as though the Victorian inhabitants of this Tudor manor had just downed tools and popped outside for a moment. There was a great trail indoors for the children to do. I thought my then-two-year-old and four-year old would be too young but they weren't at all. The house was just disrobing itself from its winter hibernation, and so most rooms had a large, hidden picture of a bug in them that you had to find (huge fun at that age) and note in your little booklet. The Little One loved practicing his writing (b-e-d) and the Tiny One liked the funny bug names and their descriptions. We all loved looking for signs of spring in the kitchen garden and on the woodland walk. They loved climbing in the playground near the entrance (blowing off those long-car-drive cobwebs) while watching planes soar overhead. They loved the second, surprise woodland playground even more - tree trunk steps, zip wires, climbing frames, houses. It was always close to rain but we managed to miss it. It was cold enough to legitimately deny the ice-cream pleas (why is a cake never enough?!) but throw the coats off while running across the grass. We managed a picnic (coats on). We were home in time for tea.